"'Dear Grandpa, why?' 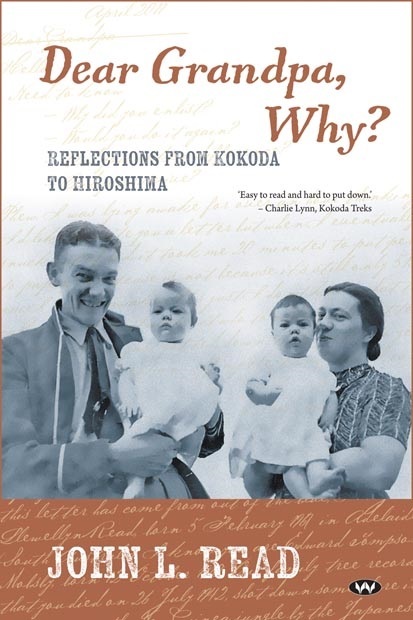 is a question that has been asked many times over, by descendants of those who have died in war. John L. Read, however, has placed his energy into actually seeking an answer to his own question." This is the story of Tetepare, the largest uninhabited island and one of the conservation gems of the South Pacific. This book is a practical field guide to the identification of arid zone fauna using tracks and other signs. Photos, measurements, identification tips and distribution maps are provided for a range of mammal, reptiles, bird and invertebrate species. 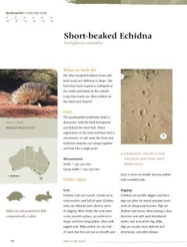 The book outlines a national monitoring technique for rare arid zone species based on a repeatable, standardised series of track monitoring sites. This guide is designed to be used by a range of stakeholders including indigenous groups, landholders, naturalists, field biologists and the general public. Red Sand Green Heart explains how the unique wildlife and vegetation of the Australian outback have been shaped by the harsh climate of this vast, infertile land. In recent years indigenous groups have been joined by pastoralists, conservationists, miners, tourists and military, communications and transport users as key stakeholders in the outback. Red Sand Green Heart documents exciting new discoveries and describes the fascinating life of some of the Outback's most interesting creatures. The roles of different industries, organisations and the public in outback conservation, which is vital to prevent the extinctions that are still occurring today are also explored. Through vivid, personal stories John shares his experiences as an ecologist making new discoveries, challenging conventional approaches to pastoralism, mining, tourism and environmental management, and witnessing the precarious balance of nature as species are pitted against the harsh climate of the outback. Presented in a non-scientific way, Red Sand, Green Heart: Ecological Adventures in the Outback evokes a humorous, entertaining and informative picture of Australia's desert region and the environmental issues that affect us all. Contact Ecological Horizons for more information about Red Sand Green Heart. "From taipan snakes and pelicans to hippie activists and hardline miners, John Read brings to life the characters, creatures and cultures of the outback." Read, J., Moseby, K. and Lander, M. (2014). Comparison of three survey techniques for locating Malleefowl mounds Proceedings of the 5th National Malleefowl Forum 2014 pp: 174-182. Read, J.L., Tyler, M.J. and Robinson, M. (2015). Recruitment and abnormality incidence of a desert frog assemblage at an Australian copper mine. Environmental Management and Restoration 16: 224-228. Moseby, K.E. and Read, J.L. (2014). The use of camera traps to monitor poison bait uptake. In Camera Trapping in Wildlife Research and Management (Meek, P. D., Ballard, A. G., Banks, P. B., Claridge, A. W., Fleming, P. J. S., Sanderson, J. G., and Swann, D. E., Eds. ), CSIRO Publishing, Melbourne, Australia. Hayward, M.W., Moseby, K. and Read, J.L. (2014). The role of predator exclosures in the conservation of Australian fauna. Chapter 15 in A. S. Glen and C. R. Dickman (eds) Carnivores of Australia CSIRO Publishing, Collingwood, Australia. Read, J.L. and Scoleri, V. (2014). Ecological Implications of Reptile Mesopredator Release in Arid South Australia. Journal of Herpetology 49: 64-69. Read, J.L, Gigliotti, F., Darby, S. and Lapidge, S. (2014). Dying to be clean: Pen trials of novel cat and fox control devices. International Journal of Pest Management 60: 166-172. Read, J.L. (2013). Red Sand, Green Heart: Ecological adventures in the outback. Revised Ed. PAGE Publishing, Adelaide. Read, J.L (2013). The birds of Tetepare Island, Solomon Islands Australian Field Ornithology 30: 67–78. Read, J.L., Kovac, K, Brook, B.W. and Fordham, D.A. (2012). Booming during a bust: Asynchronous population responses of arid zone lizards to climatic variables. Acta Oecologica 2012: 51-61. Moseby, K.E., Neilly, H., Read, J.L. and Crisp, H.A. (2011). Interactions between a Top Order Predator and Exotic Mesopredators in the Australian Rangelands. International Journal of Ecology 2012: 1-15. Moseby, K.E., Read, J.L., Paton, D.C., Copley, P., Hill, B.M. and Crisp, H.A. (2011). Predation determines the outcome of 10 reintroduction attempts in arid South Australia. Biological Conservation 144: 2863-2872. Ward, M.J., Urban, R., Read, J.L., Dent, A., Partridge, T., Clarke, A., vanWeenen, J. (2011). Status of warru (Petrogale lateralis MacDonnel Ranges race) in the Anangu Pitjantjatjara Yankunytjatjara Lands of South Australia. 1. Distribution and decline. Australian Mammalogy 33: 135-41. Read , J.L. and Ward, M.J. (2011). Bringing back warru: initiation and implementation of the South Australian Warru Recovery Plan. Australian Mammalogy 33: 1-7. Read, J.L. (2011). The Last Wild Island: Saving Tetepare. Page Digital Publishing Group, Kensington Park, Australia. Moseby, K.E., Read, J.L., Galbraith, B., Munro, N., Newport, J. and Hill, B.M. (2011). The use of poison baits to control feral cats and red foxes in arid South Australia II. Bait placement, lures and non-target uptake. Wildlife Research 38: 350-358. Allen , B., Read J. L. and Medlin G. (2011). Additional records of small mammals in northern South Australia. Australian Mammalogy 33: 68-72. Read, J. and Ward, M.J. (2010). 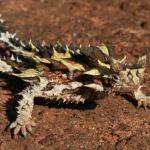 Warru Recovery Plan – Recovery of Petrogale lateralis MacDonnell Ranges Race in South Australia. Warru Recovery Team, South Australia., DENR, Adelaide. Johnston, G., Read, J. and Morley, T. (2010). 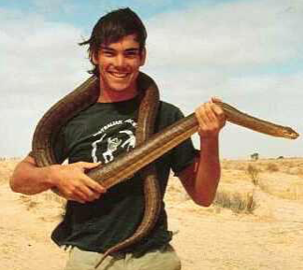 Trial reintroduction of the woma python in northern South Australia. Pp 104-107 in: Global Re-introduction Perspectives: Additional case studies from around the globe. IUCN/SSC Re-introduction Specialist Group, Abu Dhabi, UAE. Killpatrick, A.D., Warren-Smith, S.C., Read, J.L., Lewis, M.M. and Ostendorf, B. (2011). Cross-fence comparisons: Theory for spatially comprehensive, controlled variable assessment of treatment effects in managed landscapes: Ecological Informatics 6: 170-176. Read, J.L. and Eldridge, S. (2010) An optimised rapid detection technique for simultaneously monitoring activity of rabbits, cats, foxes and dingoes in the rangelands. The Rangeland Journal 32: 389-394. Read, J.L., Moseby, K.E, Briffa, J., Kilpatrick, A.D. and Freeman, A (2011) Eradication of rabbits from landscape scale exclosures: pipedream or possibility? ( Ecological Management and Restoration 12: 46-53. Read, J.L. and Cunningham, R. (2010) Relative impacts of cattle grazing and feral animals on an Australian arid zone reptile and small mammal assemblage. Austral Ecology 35: 314-324. Munro, N.T., Moseby, K.E. and Read, J.L. (2009) The effects of browsing by feral and re-introduced native herbivores on seedling survivorship in the Australian rangelands. The Rangeland Journal 31: 417-26. Smyth, A.K., Brandle R., Brook, A. Chewings, V., Fleming , M. and Read, J., (2009). Methods for identifying selecting and interpreting indicators for assessing biodiversity condition in desert Australia, using the Stony Plains bioregion as a case study. 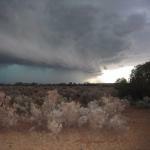 DKCRC Research Report 39: Desert Knowledge CRC, Alice Springs. Read, J.L and Kilpatrick, A.D. (2009). Improved conservation status of Atriplex kochiana Maiden. Trans. Roy. Soc. S. Aust. 133: 172-177. Moseby, K.E, Hill, B.M. and Read, J.L. (2009). Arid Recovery- A comparison of reptile and small mammal populations inside and outside a large rabbit, cat and fox-proof exclosure in arid South Australia. Austral Ecology 34: 156-169. Moseby, K.E. and Read, J.L. (2008). Bolam's Mouse Pseudomys bolami. Pp 618-619 in: The Mammals of Australia 3rd edition eds S. VanDyck and R. Strahan. Reed New Holland, Sydney. Kerle, J.A., Kutt, A.S. and Read, J.L. (2008). Desert Mouse Pseudomys desertor pp 625-626 in : The Mammals of Australia 3rd edition eds S. VanDyck and R. Strahan. Reed New Holland, Sydney. Moseby, K.E. and Read, J.L. (2006). The efficacy of feral cat, fox and rabbit exclusion fence designs for threatened species protection. Biological Conservation 127: 429-437. Read, J.L. and Moseby, K.E. (2005). Vertebrates of Tetepare Island, Solomon Islands. Pacific Science 60: 69-79.
severity of environmental impacts. Journal of Environmental Management 77: 157-164. Read, J.L. (2004). Catastrophic drought-induced die-off of perennial chenopod shrubs in arid Australia following intensive cattle browsing. J. Arid Environs 58: 535-544. Read, J.L. and Wilson, D. (2004). Scavengers and detritivores of kangaroo harvest offcuts in arid Australia. Wildlife Research 31: 51-56. Andersen, A.N., Fisher, A., Hoffmann, B.D., Read, J.L. and Richards, R. (2004). Use of terrestrial invertebrates for biodiversity monitoring in Australian rangelands, with particular reference to ants. Austral Ecology 29: 87-92. Read, J.L. (2003). Red Sand, Green Heart: Ecological adventures in the outback. Lothian, Melbourne. Read, J. (2003). Desert Warming: What are the consequences of global warming on our desert environments? Nature Australia 27: 38-43. Read, J.L. (2003). Are miners the bunnies or the bilbies of the rangelands? Rangeland Journal 25: 172-182. Wilson, D. and Read, J.L. (2003). Kangaroo harvesters: fertilising the rangelands. Rangeland Journal 25: 47-55. Read, J.L. (2002). Experimental trial of Australian arid zone reptiles as early warning indicators of overgrazing by cattle. Austral Ecology 27: 55-66. Read, J.L. (2001). Life on the Moon: What sort of animals could this moonscape possibly support? Nature Australia Winter: 42-49. Bowen, Z. and Read, J.L. (1998) Population and demographic patterns of rabbits ( Oryctolagus cuniculus) at Roxby Downs in arid South Australia and the influence of rabbit haemorrhagic disease. Wildlife Research 25: 655-662. Read, J. and Bowen, Z. (2001). Population dynamics, diet and aspects of the biology of feral cats and foxes in arid South Australia. Wildlife Research 28: 195-203. Read, J.L. and Moseby, K.E. (2001). Factors affecting pitfall capture rates of small ground vertebrates in arid South Australia. I. The influence of weather and moon phase on capture rates of reptiles. Wildl. Res. 28: 53-60. Moseby, K.E. and Read, J.L. (2001). Factors affecting pitfall capture rates of small ground vertebrates in arid South Australia. II. Optimum pitfall trapping effort. Wildl. Res. 28: 61-71. Read, J.L. (2000). Baseline abnormality study of the frogs of Tampakan, South Cotabato Province, Mindanao, Philippines. Asia Life Sciences 9: 1-6. Read, J.L. and Andersen, A.N. (2000). The value of ants as early warning bioindicators: responses to pulsed cattle grazing at an Australian arid zone locality. J. Arid Environs. 45: 231-51. Read, J.L, Ebdon F.R. and Donohoe, P. (2000). The terrestrial birds of the Roxby Downs Area: a ten year history. S. Aust. Orn. 33: 71-83. Read, J.L., Reid, N and Venables, W.N. (2000). Which bird species are useful bioindicators of mining and grazing impacts in arid South Australia? Environmental Management 26: 215-232. Read, J.L. (1999). Bird colonisation of a remote arid settlement. Australian Bird Watcher 18: 59-67. Read, J.L. (1999). Longevity, reproductive effort and movements of three sympatric Australian arid zone gecko species. Aust. J. Zool. 47: 307-316. Read, J.L. (1999). Diet and causes of mortality of the Trilling Frog , Neobatrachus centralis. Herpetofauna 29: 2-7. Read, J.L. (1999). A strategy for minimising waterfowl deaths on toxic ponds. J. Appl. Ecol. 36: 345-350. Read, J.L. (1999). Birds, reptiles and ants as indicators of ecological impacts of mining and pastoralism at Olympic Dam in the Australian arid zone. Unpublished PhD Thesis, Department of Ecosystem Management, University of New England, Armidale. Read, J.L. (1999). Abundance and recruitment patterns of the Trilling Frog ( Neobatrachus centralis) in the Australian arid zone. Aust. J. Zool. 47: 393-404. Read, J.L. (1999). The initial response of a chenopod shrubland plant and invertebrate community to intensive grazing pulses. Rangeland J. 21: 169-193. Read, J.L. and Badman, F.J. (1999). Birds of the Lake Eyre South region. Vol. 3, in: (W.J.H. Slater ed.) Lake Eyre South Monograph Series, RGSSA, Adelaide. Read, J., Copley, P. and Bird, P. (1999). The distribution, ecology and current status of Pseudomys desertor in South Australia Wildl. Res. 26: 453-462. Read, J.L. and Owens, H.M. (1999). Reptiles and amphibians of the Lake Eyre South region. Vol. 1, Part 3 in: (W.J.H. Slater ed.) Lake Eyre South Monograph Series, RGSSA, Adelaide. Read, J.L. and Pickering, R. (1999). Ecological and toxicological effects of exposure to an acidic, radioactive tailings storage Environmental Monitoring and Assessment 54: 69-85. Owens, H.M. and Read, J.L. (1999). Mammals of the Lake Eyre South region. Vol. 1, Part 2 in: (W.J.H. Slater ed.) Lake Eyre South Monograph Series, RGSSA, Adelaide. Moseby, K., Read, J., Gee, P. and Gee, I. (1998). A study of the Davenport Range Black-footed Rock Wallaby colony and possible threatening processes. Final Report to Wildlife Conservation Fund, Dept Environment and Heritage, Adelaide. Read, J.L. (1998). Animal bioindicators of mining disturbance at Olympic Dam. Fauna Habitat Reconstruction after Mining Workshop (Eds. C.J. Asher and L.C. Bell) pp. 111-115, ACMRR. Read, J.L. (1998) Reptiles and amphibians of the Kau Wildlife Area near Madang: A valuable conservation resource. Science in New Guinea 23: 145-151. Read, J.L. (1998) Hemmed in on all sides? : the status of the restricted gecko, Nephrurus deleani. Herpetofauna 28:30-38. Read, J.L. (1998). The ecology of sympatric scincid lizards ( Ctenotus) in arid South Australia. Aust. J. Zool. 46: 617-629. Read, J.L. and Ebdon, R (1998). Waterfowl of the Arcoona Lakes: An important arid zone wetland complex in South Australia. Australian Bird Watcher 17: 234-244. Bowen, Z.E. and Read, J.L. (1998). Population and demographic patterns of rabbits( Oryctolagus cuniculus) at Roxby Downs in arid South Australia and the influence or rabbit haemorrhagic disease. Wildl. Res. 25: 655-662. Moseby, K.E. and Read, J.L. (1998). Population dynamics and movement patterns of Bolam's mouse, Pseudomys bolami, at Roxby Downs. Australian Mammalogy 20: 353-368. Read, J.L (1997). Stranded on desert islands? Factors shaping animal populations in Lake Eyre South. Global Ecology and Biogeography Letters 6: 431-438. Read, J.L. (1996). Use of ants to monitor environmental impacts of salt spray from a mine in arid South Australia. Biodiversity and Conservation 5: 1533-1543. Read, J.L. (1996). Fauna of the Elliot Price Conservation Park. Sth. Aust. Nat. 69: 4-11. Read, J.L., Bird, B. and Greenfield, C. (1996). Southern range extensions of Flock Bronzewings Phaps histrionica in South Australia including a breeding record. S. Aust. Orn. 32: 99-102. Dorfman, E.J. and Read, J.L. (1996). Nest predation by corvids on cormorants in Australia. Emu 96: 132-135. Gee, P., Gee, I. and Read, J. (1996). An annotated bird list from the Davenport Ranges, South Australia. S. Aust. Orn. 32: 76- 81. Read, J.L. (1995). Subhabitat variability: A key to the high reptile diversity in chenopod shrublands. Aust. J. Ecol. 20: 494-501. Read J.L. (1995). Recruitment characteristics of the White Cypress Pine ( Callitris glaucophylla) in arid South Australia. Rangel. J. 17: 228-240. Read, J.L. (1995). First South Australian record of the Oriental Cuckoo Cuculus saturatus. S. Aust Orn 32: 62-63. Read, J.L. (1995). Gull-billed Tern predation on dragons; a possible range limiting factor for Arcoona Dragons ( Ctenophorus fionni)? Herpetofauna 25: 50-53. Read, J.L. and Niejalke, D. (1995). Brolgas: The storks of the mound springs. Xanthopus 13: 6-7. Read, J.L. (1995). The ecology of the Grass Owl Tyto capensis south of Lake Eyre. S. Aust. Orn. 32: 58-60. Read, J.L. (1994). A retrospective view of the quality of the fauna component of the Olympic Dam Project Environmental Impact Statement. J. Env. Manage. 41:167-185. Read, J.L. (1994). 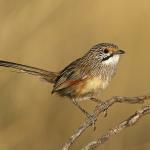 The diet of three species of Firetail Finches in temperate South Australia. Emu 94: 1-8. Read, J.L. (1994). A major range extension and new ecological data on Oxyuranus microlepidotus (Reptilia: Elapidae). Trans Roy Soc. S. Aust 118: 143-145. Read, J.L. and Tyler, M.J. (1994). Natural levels of abnormalities in the Trilling Frog ( Neobatrachus centralis) at the Olympic Dam Mine. Bull. Environ. Contam. Toxicol. 53: 25-31. Read, J.L. (1992). Influence of habitats, climate, grazing and mining on the small terrestrial vertebrates at Olympic Dam, South Australia. Rangel. J. 14: 143-156. Read, J.L. (1992). Ecological and biological notes on the rare plant Hemichroa mesembryanthema F. Muell (Amaranthaceae). Trans. Roy. Soc. S. Aust. 116: 145-146. Waterman, M.H. and Read, J.L. (1992). Breeding success of the Australian Pelican Pelecanus conspicillatus on Lake Eyre South in 1990. Corella 16: 123-126. Read, J.L. (1991). Consumption of seeds by Red-browed Firetails Neochmia temporalis at feeders: dehusking rates and seed choice. Corella 15: 19-23. Read, J.L. (1991). Range extensions for the Flock Pigeon in South Australia. S. Aust. Orn 31: 72. Read, J.L. (1991). Reptiles and Amphibians. Ch. 6 in: A Natural History of the Lake Eyre region. A visitor's guide. Eds. Badman, F.J., Arnold, B.K. and Bell, S.L. The National Parks and Wildlife Service's Northern Consultative Committee, Port Augusta. Read, J.L. and Bedford, G. (1991). 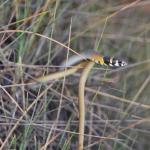 The distribution and ecology of the Pygmy Copperhead Snake ( Austrelaps labialis). Herpetofauna 21: 1-6. Read, J.L. and Badman, F.J. (1990). Reptile densities in chenopod shrubland at Olympic Dam, South Australia. Herpetofauna 20: 3-7. Read, J.L. and Tyler, M.J. (1990). The nature and incidence of post-axial, skeletal abnormalities in the frog Neobatrachus centralis Parker at Olympic Dam, South Australia. Trans. R. Soc. S. Aust. 144: 213-217. Moseby, K.E., Nano, T., and Southgate, R. (2009). Tales in the Sand: A guide to identifying arid zone fauna using spoor and other sign. Ecological Horizons, South Australia. Moseby, K.E., Hill, C., Mooney, T., Peacock, D., Morris, K. , Copley, P. and Brandle, R. A Trial Reintroduction of the Western Quoll (Dasyurus geoffroii) into the Flinders Ranges National Park, South Australia. Pp 228-230 In Global Reintroduction Perspectives 2016; case studies from around the globe (Ed. P.S. Soorae). IUCN Reintroduction Specialist Group, Gland Switzerland. Moseby, K.E., Carthey, A. and Schroeder, T. (2015). The influence of predators and prey naivety on reintroduction success; current and future directions. Pp 29-42 In Advances in Reintroduction Biology of Australian and New Zealand Fauna. (Eds. Armstrong, D.P., Hayward, M.W., Moro, D. and Seddon, P.J. ), CSIRO Publishing, Melbourne, Australia. Moseby, K.E. and Read, J.L. (2014). The use of camera traps to monitor poison bait uptake. In Camera Trapping in Wildlife Research and Management (Eds. Meek, P. D., Ballard, A. G., Banks, P. B., Claridge, A. W., Fleming, P. J. S., Sanderson, J. G., and Swann, D. E.), CSIRO Publishing, Melbourne, Australia. Hayward, M., Moseby, K.E. and Read, J.R. (2014). The role of predator exclosures in the conservation of Australian Fauna. Pp 363-380 In Carnivores in Australia (Eds. A. Glen and C. Dickman). CSIRO publishing, Collingwood, Victoria. Moseby, K.E. and Read, J.L. (2008). Bolam's Mouse Pseudomys bolami. Pp 618-619 In The Mammals of Australia 3rd edition (Eds S. VanDyck and R. Strahan), Reed New Holland, Sydney. Pedler, R., West, R., Read, J.L., Moseby, K.E., Letnic, M., Keith, D., Leggett, K., Ryall, S, Kingsford, R. (2018) Conservation challenges and benefits of multispecies reintroductions to a national park – a case study from New South Wales, Australia. Pacific Conservation Biology 24, 1-12. Moseby, K.E., Crowther, M., and Letnic, M. (2018). Ecological role of an apex predator revealed by a reintroduction experiment and bayesian statistics. Ecosystems https://doi.org/10.1007/s10021-018-0269-6. Moseby, K.E., Blumstein, D., Letnic, M. and West, R. (2018). Choice or Opportunity? Are post-release social groupings influenced by familiarity or reintroduction protocols? Oryx. White, L.C., Moseby, K.E., Thomson, S.C., Donellan, S.C. and Austin, J.J. (2018) Long-term genetic consequences of mammal reintroductions into an Australian conservation reserve, Biological Conservation 219, 1-11, https://doi.org/10.1016/j.biocon.2017.12.038. Moseby, K., Letnic, M. Blumstein, D. and West, R. (2018). Designer Prey: Can controlled predation accelerate selection for anti-predator traits in naïve populations? Biological Conservation 217, 213-221. doi: 10.1016/j.biocon.2017.09.022. Dawson, S. J., Adams, P. J., Moseby, K. E., Waddington, K. I., Kobryn, H. T., Bateman, P. W. and Fleming, P. A. (2017), Peak hour in the bush: linear anthropogenic clearings funnel predator and prey species. Austral Ecology. doi:10.1111/aec.12553. Legge, S., Murphy, B.P., McGregor, H.,…. Moseby, K.E.,,,,,(2017) Enumerating a continental-scale threat: How many feral cats are in Australia? Biological Conservation 206, 293-303. Bengsen, A. J., Algar, D., Ballard, G., Buckmaster, T., Comer, S., Fleming, P. J. S., Moseby, K.E.. . . Zewe, F. (2016). Feral cat home-range size varies predictably with landscape productivity and population density. Journal of Zoology, 298(2), 112-120. dx.doi.org/10.1111/jzo.12290. Moseby, K.E., Read, J.L., McLean, A., Rogers, D. and Ward, M. (2016). How high is your hummock? The importance of Triodia height as a habitat predictor of an endangered marsupial in a fire prone environment. Austral Ecology 41(4), 382-395. Newsome, T, Ballard, G, Crowther, M.S., Glen, A.S., Dellinger, J., Fleming, P., Greenville, A., Johnson, C.N., Letnic, M., Moseby, K.E., Nimmo, D., Nelson, M., Read, J.L., Ripple, W., Ritchie, E., Shores, C., Wallach, A., Wirsing, A. & Dickman, C. (2015). Resolving the value of the dingo in ecological restoration. Ecological Restoration doi:10.1111/rec.12186. McGregor, H.M. and Moseby, K.E. (2014). Improved technique for capturing the Greater Bilby Macrotis lagotis using burrow cage traps. Australian Mammalogy 36, 259-260. Meek, P., Ballard, G., Claridge, A., Kays, R., Moseby, K., Obrien, T., O'Connell, A., Sanderson, J., Swann, D.E., Tobler, M. and Townsend, S. (2014). Recommended guiding principles for reporting on camera trapping research. Biodiversity and Conservation 10. 1007/s10531-014-0712-8. Matthews, A., Ruykys, L., Ellis, B., FitzGibbon, S., Lunney, D., Crowther, M., Glen, A.S., Purcell, B., Moseby, K., Stott, J., Fletcher, D., Wimpenny, C., Allen, B.L., Van Bommel, L., Roberts, M., Davies, N.,Green, G., Newsome, T., Ballard, G., Fleming, P., Dickman, C.R., Eberhart, A., Troy, S., McMahon, C. and Wiggins, N. (2013). The Success of GPS Collar Deployments on Mammals in Australia. Australian Mammalogy dx.doi.org/10.1071/AM12021. Moseby, K.E., Cameron, A. and Crisp, H.A. (2012). Can predator avoidance training improve reintroduction outcomes for the Bilby (Macrotis lagotis) in arid Australia? Animal Behaviour 83(4) 1011. Moseby, K.E., Neilly, H., Read, J.L. and Crisp, H.A. (2012) Interactions between a top order predator and exotic mesopredators. International Journal of Ecology Article ID 250352, doi:10.1155/2012/250352. Moseby, K.E., Read, J.L., Paton, D.C., Copley, P., Hill, B.M. and Crisp, H.M. (2011). Predation determines the outcome of 11 reintroduction attempts in arid Australia. Biological Conservation 144, 2863-2872. Moseby, K.E. and Hill, B.M (2011). The use of poison baits to control feral cats and red foxes in arid South Australia 1. Aerial Baiting Trials. Wildlife Research, 38, 338-349. Moseby, K.E., Read, J.L., Galbraith, B., Munro, N., Newport, J and Hill, B.M. (2011). The use of poison baits to control feral cats and red foxes in arid South Australia II. Bait type, placement, lures and non-target uptake. Wildlife Research 38, 350-358. Read, J.L., Moseby, K.E., Briffa, J., Kilpatrick, A.D. and Freeman, A (2011). Eradication of rabbits from landscape scale exclosures: pipedream or possibility? Ecological Management and Restoration 12, 46-53. Crisp, H. and Moseby, K.E. (2010). One-way gates: Initial trial of a potential tool for preventing overpopulation within fenced reserves. Ecological Management and Restoration 11, 139. James, A.L., Eldridge, D.J. and Moseby, K.E. (2010). Foraging pits, litter and plant germination in an arid shrubland. Journal of Arid Environments 74, 516-520. Munro, N., Moseby, K.E. and Read, J.L. (2009). The effects of browsing by feral and re-introduced native herbivores on seedling survivorship in the Australian rangelands. The Rangeland Journal 31, 417-426. Moseby, K.E., Stott, J. & Crisp, H. (2009). Improving the effectiveness of poison baiting for the feral cat and European fox in northern South Australia: The influence of movement, habitat use and activity. Wildlife Research 36: 1-14. Bice, J.K. and Moseby, K.E. (2008). Diet of the re-introduced Greater Bilby (Macrotis lagotis; Peramelidae) and Burrowing Bettong (Bettongia lesueur; Potoroidae) in the Arid Recovery Reserve, Northern South Australia. Australian Mammalogy 30: 1-12. Moseby, K.E. and Read, J.L. (2006). The efficacy of feral cat, fox and rabbit exclusion fence designs for threatened species protection. Biological Conservation.127: 429-437. Moseby, K.E., Owens, H., Brandle, R, Bice, J.K. and Gates, J. (2006). Variation in population dynamics and movement patterns between two geographically isolated populations of the dusky hopping mouse (Notomys fuscus). Wildlife Research 33: 222-232. Moseby, K.E., De Jong, S., Munro, N. and Pieck, A. (2005). Home range, activity and habitat use of the European rabbit (Oryctolagus cuniculus) in arid South Australia; implications for control. Wildlife Research 32: 305-311. Moseby, K.E., Selfe, R. and Freeman, A. (2004). Attraction of auditory and olfactory lures to Feral Cats, Red Foxes, European Rabbits and Burrowing Bettongs. Ecological Management and Restoration 5: 228-231. Moseby K.E. and Bice (2004). A trial reintroduction of the Greater Stick-nest Rat (Leporillus conditor) in arid South Australia. Ecological Management and Restoration. 5: 118-124. Bolton, J. and Moseby, K.E. (2004). The activity of Sand Goannas Varanus gouldii and their interaction with reintroduced Greater Stick-nest Rats Leporillus conditor. Pacific Conservation Biology 10: 193-201. Finlayson, G.R. and Moseby, K.E. (2004) Managing confined populations: The influence of density on the home range and habitat use of re-introduced burrowing bettongs (Bettongia lesueur). Wildlife Research 31: 457-463. Moseby, K.E. and O'Donnell, E. (2003). 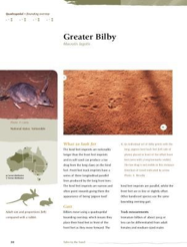 Reintroduction of the greater bilby, Macrotis lagotis (Reid) (Marsupialia:Thylacomyidae), to northern South Australia: survival, ecology and notes on reintroduction protocol. Wildlife Research 30:15-27. Moseby, K.E. and Read, J.L. (2001). Factors affecting pitfall capture rates of small ground vertebrates in arid South Australia. II. Optimum pitfall trapping effort. Wildlife Research 28:61-71. Read, J.L. and Moseby, K.E. (2001) Factors affecting pitfall capture rates of small ground vertebrates in arid South Australia.I. The influence of weather and moon phase on capture rates of reptiles. Wildlife Research 28: 53-60. Moseby, K.E. and Read, J.L. (1999). Population dynamics and movement patterns of Bolam's Mouse, Pseudomys bolami, at Roxby Downs South Australia. Australian Mammalogy 20: 353-368. Moseby, K.E., Brandle, R. and Adams, M. (1999) Distribution, habitat and conservation status of the rare dusky hopping-mouse, Notomys fuscus (Rodentia: Muridae). Wildlife Research 26: 479-494. Brandle, R. and Moseby, K. E. (1999) Comparative ecology of two populations of Pseudomys australis in northern South Australia. Wildlife Research 26: 541-564. Brandle, R. and Moseby, K.E. and Adams, M. (1999) The distribution, habitat requirements and conservation status of the plains rat, Pseudomys australis (Rodentia:Muridae). Wildlife Research 26: 463-477.